“CoalWatch has been urging the EAO to terminate the Raven Coal Mine Project EA for over nine months. Despite this decision being long overdue, I’m very pleased the EAO decided to terminate the Raven Coal Mine Project EA,” noted CoalWatch president John Snyder. “Finally, the threat posed to the Comox Valley and Port Alberni from the ill-advised Raven Coal Mine Project, has been extinguished,” added Snyder. The termination was fully expected, in light of the resignation of the entire board of directors for Compliance Energy, February 25 - the company behind the Raven coal mine project. The full-scale resignation came after the mass withdrawal of financial partners for the mine. 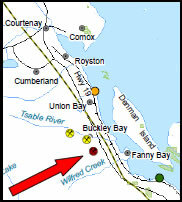 While this is the end of the Raven Coal Mine Project, the coal resources in the Comox Valley still remain. CoalWatch urges everyone to remain vigilant and to continue the fight to protect our vulnerable watersheds flowing into Baynes Sound. CoalWatch would like to thank the local governments, numerous organizations, and the thousands of individuals, who over the past 6 years, have raised concerns regarding the Raven Coal Mine Project. “Make no mistake, our cumulative efforts, be they large or small, have made a huge difference in the final outcome on this issue,” said Snyder.